In the mid- to late-1860’s, Cincinnati had two major base ball clubs, the Cincinnati Base Ball Club (better known as the “Red Stockings”) and the Buckeye Base Ball Club of Cincinnati (a former townball club). The former had superior leadership and was able to pay for premium talent (including a few former Buckeyes). This led them to take their nine across the country in 1869, where they defeated all opponents, spread the glory of professional base ball from coast to coast, and put Cincinnati on the sporting map. The latter club… did not, folding after the 1869 season. The Red Stockings 57-0 season made them one of baseball’s greatest legends and earned Cincinnati the distinction of the “Birthplace of professional baseball”. They didn’t lose a game until June of 1870 after 81 straight wins. The club folded at the end of the 1870 season for financial reasons. In 2000, a vintage base ball club named the Sharonville Shamrocks re-organized, resurrecting the “Cincinnati Red Stockings” name and becoming the Cincinnati Vintage Base Ball Club. A year later, the club sprouted a second team, the resurrected Cincinnati Buckeyes. Sporting uniforms and equipment recreated as faithfully as possible, and adhering to the rules and customs of base ball as published for the 1869 season, the two teams brought vintage base ball to Cincinnati. Their mission is to provide an entertaining educational experience that accurately portrays the game of base ball according to the rules and customs of the day. 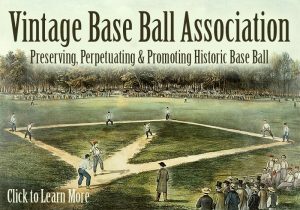 Club members share a mutual respect for the game of base ball and one another, and through competitive matches with other clubs, will develop increased skills and understanding about the beginnings of the National Pastime. The most obvious difference between vintage “base ball” and modern baseball are the lack of gloves, which weren’t widely used yet in 1869. Another striking difference is the atmosphere of the game, where great value is placed on honest sportsmanship and gentlemanly behavior, and spectacular plays get hearty “Huzzahs” no matter which team is favored. You can learn more about the vintage game HERE. The two teams host their vintage base ball games at Dan Lyon Field in Heritage Village Museum – a period village located in Sharon Woods Park, just north of Cincinnati, OH. The Village offers a truly appropriate backdrop for the vintage game, and has become one of the finest spots to view a game in the vintage sport. They also travel the region and Midwest to play other vintage ball teams, and often at historical venues, museums or period-themed events, having played ball at such landmarks as Cooperstown, Gettysburg, The Hermitage, Greenfield Village at The Henry Ford, several Civil War reenactments, and even Great American Ballpark, home of the MLB Cincinnati Reds. Today, the Cincinnati Red Stockings proudly continue to carry the honor of their namesake and spread the game of base ball throughout the land. Although today’s players are no longer professional and not quite to the skill of the actual 1869 team, the Red Stockings are among the finest and most well-known vintage teams in the land. So please… Come out and catch the 1869 Cincinnati Red Stockings in action this Spring and Summer! © 1869 Cincinnati Red Stockings 2019. Powered by WordPress and Sports Team Theme.